It’s been a while since we’ve hosted a giveaway on here, so this week one reader can get their hands on the COMET & CHARGE! September Giveaway. You can get some Space: 1999 and Rocky movies this month. COMET TV has so many cool things in September! COMET TV is the new home of the cult classic Space: 1999! The out of this world series starring Martin Landau is a fun retro adventure, you’ll love! Plus, there are Godzilla Double Features, Dr. Who and more! Plus, we can’t forget the action network CHARGE! There is a Rocky marathon featuring the classic film series all month long! CHARGE! is an action network showing the most “kickin’” and “punchin’” films ever created. 1 – Limited Edition Space: 1999 COMET TV T-shirt: Exclusive to this month, we’ve created an exclusive shirt celebrating the retro goodness of this classic series! 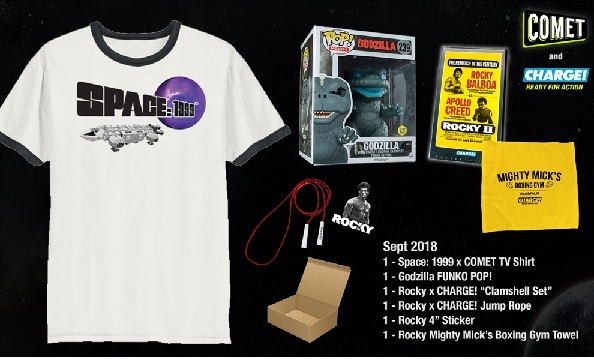 1 – Rocky Exclusive Charge! Clamshell Box: While there may not be a VHS tape inside, this pack has some of the classic Rocky artwork. Yo Adrian! To win, simply email jordan@manlymovie and request the pack. First come first served. This offer applies to residents of the United States only, no P.O. Boxes will be accepted. Include your name and postal address. Each household is only eligible to win COMET TV + CHARGE! September Pack via blog reviews and giveaways. Only one entrant per mailing address per giveaway. If you have won the same prize on another blog, you will not be eligible to win it again. Winner is subject to eligibility verification.